With concerns about over treatment of pets and vaccine reactions however, it is important to consider why vaccination and parasite prevention is still so crucial throughout the whole life of your pet. Vaccines protect against contagious, potentially fatal diseases in cats and dogs and have saved millions of pet lives. Like many human diseases, some of the diseases we vaccinate against in cats and dogs such as distemper, infectious hepatitis and panleukopenia virus have become mercifully rare but in the absence of vaccination would re emerge very quickly. Other deadly pathogens such as Parvo virus and Leptospirosis have remained more common because of wildlife reservoirs. Cat flu viruses and Feline Leukemia virus (FELV) are also still very common because there are lots of stray and feral cats that are not vaccinated. Dogs may potentially come in to contact with parvo through fox faeces contamination and leptospirosis through water contaminated with urine from rats and other infected animals. Cat flu is airborne and therefore even indoor cats are not safe from exposure. Like any vaccine, reactions can occur in pets. Some of these are mild such as discomfort at the injection site where others are more serious such as severe allergic responses. These problems are rare and although huge numbers of cases are often quoted on anti vaccination websites and social media, these are a tiny percentage of the millions of cats and dogs vaccinated worldwide each year and kept safe as a result. It is important not to over vaccinate though. Some vaccines such as distemper, parvo and cat flu are considered ‘core’ and recommended because the threat of infection is widespread and dangerous if contracted. Others are ‘non core’ such as Lyme disease and kennel cough vaccines. This means in some cases, pets will be at risk through their lifestyle but not others. In other cases, such as kennel cough, infection is common, unpleasant and highly contagious but not quite as dangerous as some other diseases. It is important to discuss vaccination with your vet and ensure that puppies and kittens get all the vaccines they need and then regular boosters thoughout their life. In this way, they can be kept safe from life threatening but potentially preventable disease. Parasitic worms are very common in cats and dogs and can make them very ill. Some of them can also infect people so regular worm treatment of cats and dogs is important both for pet, but also human health. There are three common types of worms in cats and dogs. Roundworm, lungworm and tapeworm. Toxocara is the most common parasitic worm of cats and dogs and lives in their intestines. It is well known for the health problems it can cause people, particularly when larval worms migrate to the eye (ocular larval migrans). While many people are exposed to the parasite, only a few go on to develop disease (toxocarosis). More and more links are being uncovered to chronic illness such as asthma and epilepsy however, and the consequences of infection can be serious, but by taking a few simple precautions, pet owners can help to keep themselves safe. Almost all puppies and kittens are infected by their mums at birth (puppies) or shortly afterwards via the milk (puppies and kittens). Some natural immunity develops at around 6 months of age, but infection is topped up though the cat or dog’s life through ingesting Toxocara eggs passed in the faeces or eating small animals that have already eaten the eggs such as birds or rodents. Some worms also hide in the tissues and reactivate through the cat and dog’s life, so even indoor pets may be infected. People are infected by accidentally ingesting eggs passed in the faeces. These eggs are not infective when first passed but become so over a period of 3-7 weeks. Exposure occurs through accidentally (or deliberately in the case of children!) consuming soil containing eggs or contaminated fruit and vegetables. The eggs are sticky and sometimes transferred onto objects such as toys or pens that can be placed in the mouth. Infected pets are rarely ill although large worm burdens can cause diarrhoea or coughs. While human infection can be more serious, a few simple precautions will help to reduce contamination and risk of exposure. Picking up and responsibly disposing of dog faeces – this reduces egg contamination from faeces but also helps to prevent transmission of a wide range of bugs including food poisoning bacteria. 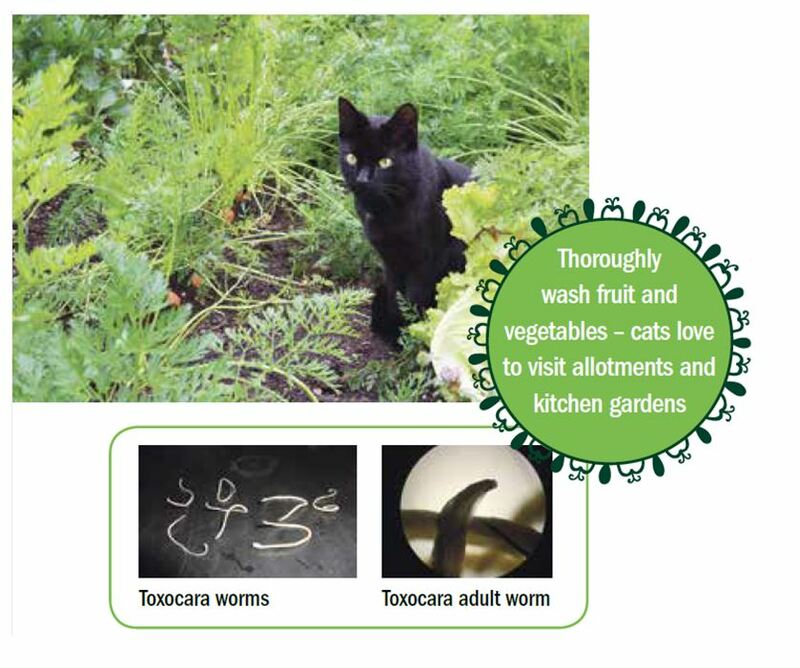 Thorough washing of fruit and vegetables – cats love to visit allotments and kitchen gardens and daefacate on lovingly grown fruit and veg. These are still completely safe for human consumption if first thoroughly washed or cooked. Good hand hygiene – washing of hands before eating and after prolonged outdoor activity reduces the risk of many parasites being transferred from hand to mouth. Covering sandpits – cats will use sandpits as giant litter trays and then bury their faeces. Covering sandpits helps to prevent cat access when not in use. Lungworm: Many of us will have seen adverts on the television over the past few years talking about the risk of lungworm to dogs and how harmful they can be. These ads refer to the canine lungworm Angiostrongylus vasorum and highlight the potential for it to cause potentially fatal disease. Foxes are the natural host for the parasite and appear to tolerate infection very well. Domestic dogs can also be infected without becoming ill but commonly will develop a cough or other breathing problems. More worryingly, a small percentage of dogs infected will develop blood clotting complications, neurological signs, heart problems or die suddenly as a result of infection. Dogs become infected mostly through eating slugs, snails and frogs. Many dogs love a gourmet slug or snail and will deliberately seek them out or eat them if they come across them in the garden or out on a walk. Some infected slugs are only a few millimetres long and may be eaten accidentally with grass or on dog treats and toys left out in the garden. Snails infected in the lab have also been shown to shed infective larvae in their slime trails but it is unknown how often that happens in natural conditions. This parasite is now present across the whole country but is very patchy in its distribution, being more common in some places than others. Some vets and dog owners live in areas which have very high levels of infection and preventative treatment in these regions with a monthly worm treatment is vitally important to keep dogs safe. In other areas, it is worth talking to local vets and dog owners to see if cases are occurring locally and whether your pet might be at increased risk. Your vet will also take your pet’s lifestyle into account with dogs that deliberately eat slugs and snails or that consume grass on a regular basis being at greater risk. Not all worm treatment are effective against lungworm so it is important to seek advice from your vet as to which preventative treatment is best for your dog if required. Tapeworm: Taenia tapeworms are large segmented worms that live in the intestines of cats and dogs, passing visible mobile segments containing eggs in the faeces. Dogs are infected through eating raw offal or meat that has now been adequately frozen before consumption. Cats are infected through hunting and eating small prey. The health of pets is rarely affected by infection but if cows or sheep eat tapeworm eggs in grass or feed contaminated with dog faeces then it can lead to meat and offal condemnation with economic hardship for farmers. A small tapeworm of dogs called Echinococcus granulosus is also transmitted the same way and can lead to large hydatid cysts forming in the human body if we accidentally ingest this tapeworm’s eggs. Dogs should be treated for tapeworm monthly if they are shedding visible segments, on a raw unprocessed diet or if they have access to fallen livestock to eliminate the risk of infection. If cats are shedding tapeworms through hunting behaviour this can be visibly repulsive and lead to gut issues in large numbers so these should also be treated monthly to eliminate the problem. The flea tapeworm Dipylidium caninum is also a large segment shedding tapeworm of both cats and dogs. They are infected through grooming fleas of their coat and people can also be infected if we accidentally ingest bits of flea under our fingernails or in our food. Flea control is the best way to get these tapeworm infections under control. Fleas: Fleas found on UK pets are almost all cat fleas as they can infest a wide range of mammals, including, cats, dogs, ferrets and rabbits. They are wingless blood sucking insects but unlike lice, most of the flea’s life stages live off the pet in your home. Adult fleas lay eggs which fall off into bedding, furniture and carpets. These then hatch into larvae which live on flea faeces or ‘dirt’ which also falls off the coat. The larvae develop into pupae which wait for a nice warm host to pass by. Sensing heat and movement the adults emerge and jump onto the host. People cannot act as hosts for cat fleas but can get bitten with itchy sores sometimes then developing, often below the knee. Control of flea infestations is a lengthy process as the pupae are near impossible to kill. Treating the house with sprays containing insecticides and growth regulators, as well as daily vacuuming helps to speed up getting rid of an infestation, but key is treating all pets that might act as hosts in the house. They should all be treated with a product that will kill fleas before they lay eggs, therefore breaking the flea life cycle. If treatment lapses, fleas can start laying eggs again, so it is best to keep treatment going to prevent infestation. Fleas have long been considered to be a seasonal problem but a combination of mild winters and our centrally heated homes means that fleas can now survive all year round. Ticks: UK ticks have been in the news a lot with an outbreak of the canine tick-borne disease babesiosis in Essex and increasing numbers of Lyme disease cases in people. Ticks that commonly live in this country do not infest houses but attach to people and pets that walk in tall grass, bracken and areas shared with deer, sheep and cows. The increase in ticks and tick-borne diseases in people and pets is thought to be due partly to a milder, wetter climate allowing ticks to active in the summer and winter as well as in their traditional spring and autumn feeding times. Increased time spent doing outdoor pursuits is also bringing us into greater contact with ticks. Our pets can still enjoy the great outdoors though by taking a few simple precautions. The bulk of Lyme disease and Babesia transmission takes at least 24 hours after ticks bite. Dogs and people who have been walking in pasture, tall grass or undergrowth should be checked for ticks at least every 24 hours and any found carefully removed with a tick hook, using a ‘twist and pull’ action. Alternatively, fine tipped tweezers can be used with a ‘straight pull’ action. Squeezing, burning or applying paraffin to ticks will stress them, leading to increased likelihood of disease transmission. It should therefore be avoided and blunt tweezers or fingers should not be used for removal. A product that rapidly kills ticks or repels them should be considered for dogs whose lifestyle put them at increased risk of tick exposure.